For a delicious and nutritious treat, try whipping up this pudding. Chia seeds contain the most omega 3 fats in the plant kingdom. 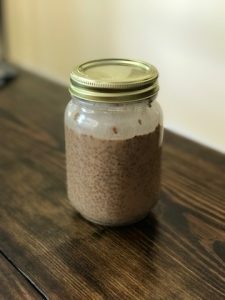 1 tablespoon organic peanut butter powder (I find it at Costco) – gives you the taste of peanut butter without all of the fat! Place in a jar and shake well. Cool in the refrigerator for at least 4 hours. Enjoy!